Old-school 100% analog signal path with modern USB/MIDI smarts. The Little Phatty can be seen in Deadmau5 studio at 1:01 in this video. When Nicky Romero decides to give the software synths a break, he reaches for the Moog Little Phatty. From a March 2008 interview on Beatport. 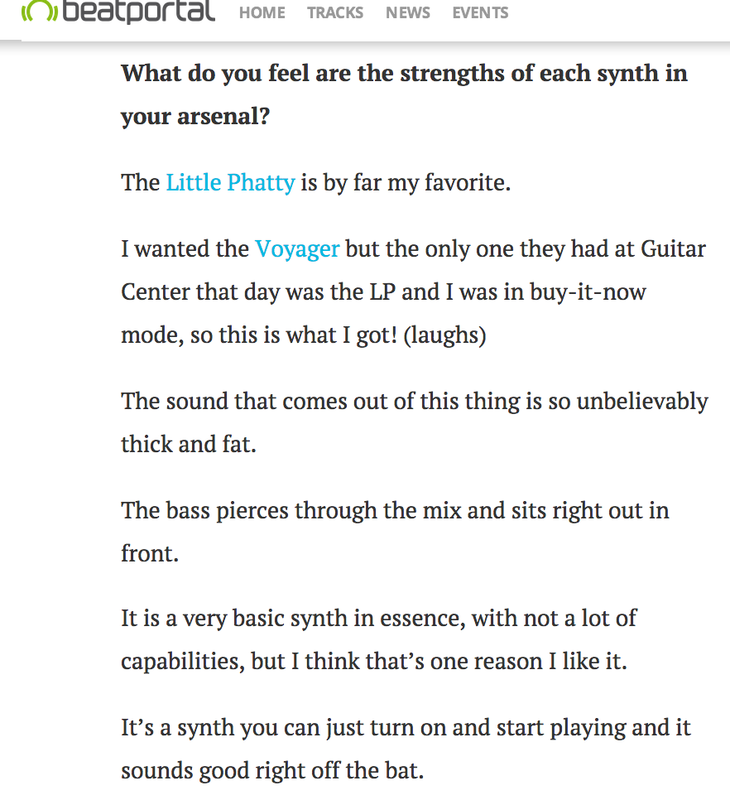 Wolfgang is asked, "What do you feel are the strengths of each synth in your arsenal?" He replies: "The Little Phatty is by far my favorite. I wanted the Voyager but the only one they had at Guitar Center that day was the LP and I was in buy-it-now mode, so this is what I got! (laughs) The sound that comes out of this thing is so unbelievably thick and fat. The bass pierces through the mix and sits right out in front. It is a very basic synth in essence, with not a lot of capabilities, but I think that’s one reason I like it. It’s a synth you can just turn on and start playing and it sounds good right off the bat." Original interview [here](http://news.beatport.com/producer-interview-wolfgang-gartner-part-2/). "I've got a Moog Little Phatty which is kind of like a digital rendition of the majority of Moog synths... pretty handy"
Jack White can be seen with a Moog Little Phatty at 1:12 and 2:14 in this live performance of "Icky Thump" by The White Stripes. 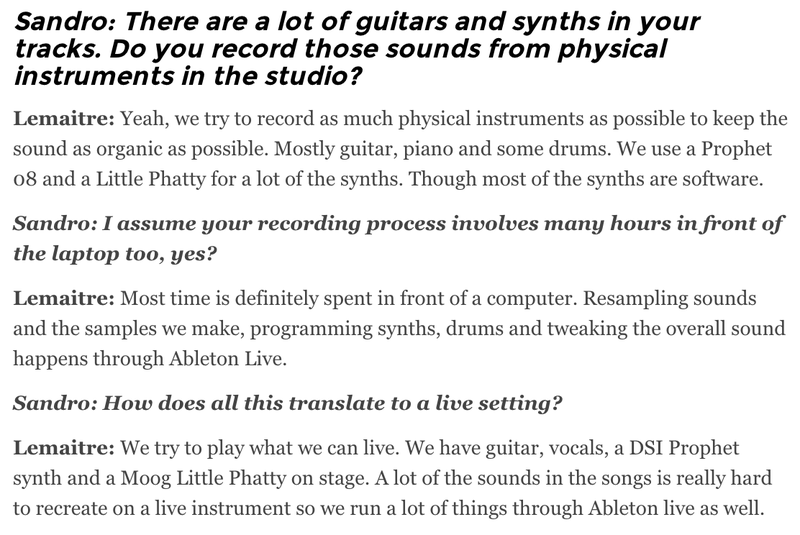 From his interview with Image-Line: "Right now my production environment is mostly my laptop and Beyerdynamic DT pro 880 headphones but in my studio i have... Moog Lil Phatty..."
"For live we use Ableton on one laptop to run stuff we can’t play, but we try to play as much as we can. We play loads of synthesizers. One runs on main stage for sounds we can’t re-create. Howard has a Moog Little Phatty, I’ve got drum pads." A photo posted by The Crystal Method on Instagram shows their Moog Little Phatty Stage II Synth keyboard. The photo is captioned, "@moogmusic monday!" Moog .. what else to say? ;) I use it when I want a very warm and phat analog sound. Quick to program and guaranteed result. In this photo we can see Moog Little Phatty Stage II Keyboard Synthesizer in Wildstylez's studio. "We try to play what we can live. We have guitar, vocals, a DSI Prophet synth and a Moog Little Phatty on stage. A lot of the sounds in the songs is really hard to recreate on a live instrument so we run a lot of things through Ableton Live as well." Original interview from May 2013 can be found [here](http://stoneyroads.com/2013/05/lemaitre). One of the synthesizers used by Tommy Lee in his electronic music side-projects. "aaaahh......Moog Christmas! " In this photo from Wyman's Twitter in December, the layout of the knobs and the small logo above the screen distinguish his early Christmas gift as the Little Phatty. When asked what his studio gear consists of, PIXL states that one of the only pieces of analog gear that he uses is a Moog Little Phatty. In this photo from Tycho's official Facebook page, you can see his Moog Little Phatty Stage II Keyboard Synthesizer. In this video at 7:40 he use moog little phatty. At 6:40 and 6:45 of this live performance by The Dead Weather, Fertita can be seen playing a Moog Little Phatty. In this video Jordan Rudess talks about his Moog Little Phatty. At 0:30 he says, "It's an awesome sounding synthesizer." 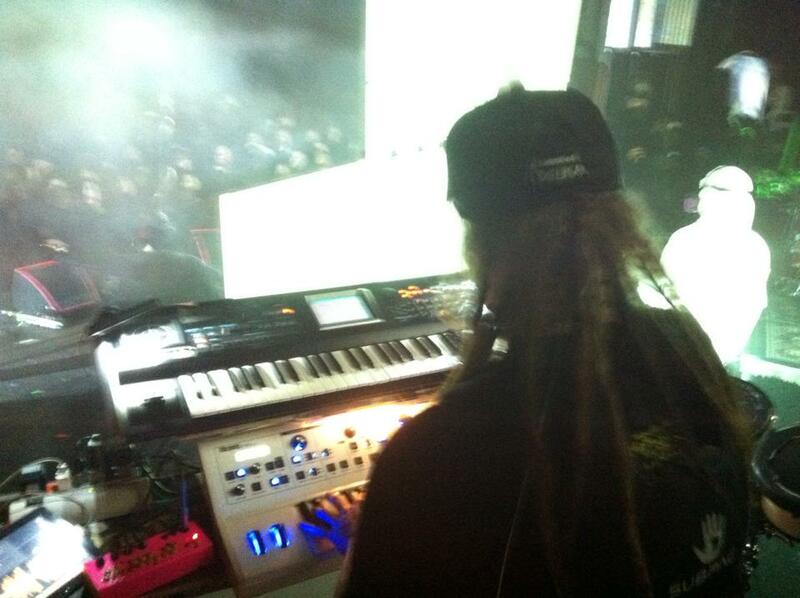 A photo of cEvin's live setup from Skinny Puppy's Eye vs. Spy tour in 2014. 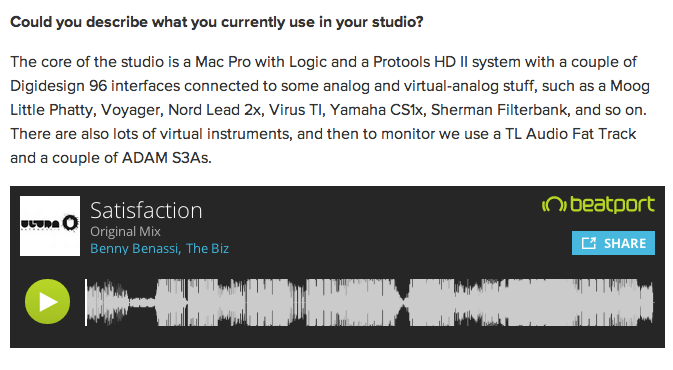 In an [article from *beatportal*](http://news.beatport.com/benny-benassis-righthand-man-cousin-alle-benassi-on-the-ghost-writing-phenomenon/), Alle is asked what's currently used in his studio, he responds, "The core of the studio is a [Mac Pro](http://equipboard.com/items/apple-mac-pro) with [Logic](http://equipboard.com/items/apple-logic-pro-x) and a [Protools HD II](http://equipboard.com/items/avid-pro-tools-hd-2) system with a couple of [Digidesign 96](http://equipboard.com/items/digidesign-96-i-o-analog-digital-converter) interfaces connected to some analog and virtual-analog stuff, such as a Moog Little Phatty, [Voyager](http://equipboard.com/items/moog-minimoog-voyager), [Nord Lead 2x](http://equipboard.com/items/nord-lead-2x-rack), [Virus TI](http://equipboard.com/items/access-virus-ti-desktop-synthesizer), [Yamaha CS1x](http://equipboard.com/items/yamaha-cs1x-control-synthesizer), [Sherman Filterbank](http://equipboard.com/items/sherman-filterbank), and so on. There are also lots of virtual instruments, and then to monitor we use a [TL Audio Fat Track](http://equipboard.com/items/tl-audio-fat-track) and a couple of [ADAM S3As](http://equipboard.com/items/adam-s3a-active-monitors)." At 10:50 in this "Rig Rundown" with *Premier Guitar*, Rush's Alex Lifeson's tech Scott Appleton mentions that Alex uses some synthesizers and we're shown a still frame of the Moog Little Phatty Stage II. Michael Schuman can be seen with a Moog Little Phatty here during a performance of 'Kalopsia', at :40-47 and again at 1:20-1:26. 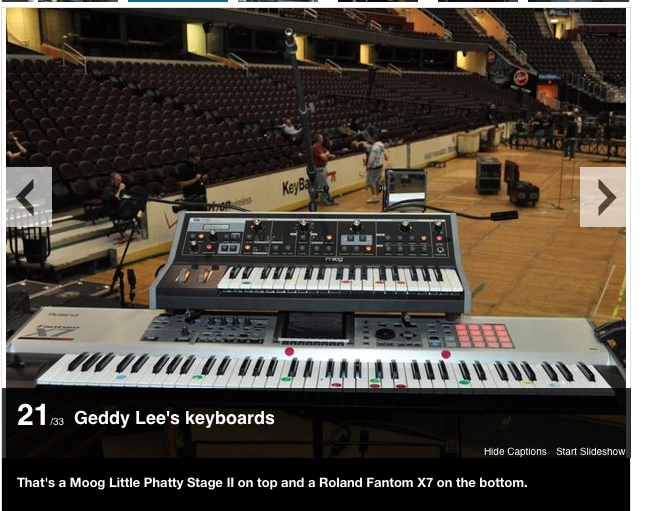 In [this article](http://www.musicradar.com/news/guitars/access-all-areas-on-the-road-with-rush-482792/22) there is a picture of Rush's current keyboard rig. The Little Phatty is on the top. Little phatty stage II in possession of Goldwasser. A true synthesis with great taste. Although in future shows his Stage Phatty would not be seen. Assuming he has retired it. In this picture of Don Diablo's studio from EMPO's [site](http://www.empo.tv/), a Moog Little Phatty Stage II keyboard synthesizer can be seen on the right side of the image. "letting the #moog speak to me" Taken from James Egbert's Instagram. "it's a little bit of a boring Synthesizer"
In this video clip posted by Amtrac, his Moog Little Phatty Stage II Keyboard Synthesizer can be seen, as he plays an arpeggio and tweaks the sound. Seen used in tracks such as "Hold on" to produce metallic sounding effects (I assume created by the moog) , here used plugged into logic. Tony Romera points to the Moog Little Phatty Stage II Synthesizer in his studio. He says, "Say hello to my new toy... Moog little phatty stage II !! :)"
In this vidoe Cory Henry is using the Moog Little Phatty Stage II. He uses Little Phatty in this and many other performances. S: Powers of Ten is your homage to Bob Moog. What does Moog mean to you, in relation to the album and how important has his products been to you and your musical journey? If you had to sum up your favourite thing about a Moog synth, what would it be? SB: Bob Moog was the inventor of some the most exciting and powerful synth engines ever built - the minimoog and the moog modular - and has always been one of my heroes. When I was a little boy of 4 years I started playing on those machines as my father owned a unbelievable collection of analogue gear those days. The warm sound of a moog just touched me so much, I can´t help it, I grew up with that. The favourite thing about a moog is the very unique warmth and pressure of its sound engines. It’s totally different from any other synth, it´s just more alive, it´s more powerful, it’s breathing, it has soul. Most of the basslines on the album weren’t even equalised much or edited dynamics-wise. The sub37 just did a great job, it’s one of the best moogs ever built. Seen here in his studio. Picture from his official facebook site shows a white Little Phatty Stage 2 used live. "Then my Moog. Every time I turn it on, for sure one sound will be used in my track." Sam can be seen using a white Little Phatty Stage II in this appearance. Nunez can be seen using a white Little Phatty Stage II in this appearance. At 28:33 you can see him playing it. The Moog Little Phatty Stage II is a keyboard synthesizer that puts you in control of a 100% analog signal path. Like the Stage and Tribute Edition before it, Little Phatty Stage II synth has 2 ultra-stable Voltage Controlled Oscillators, and a Voltage Controlled Filter. Other versatile features include an external audio input, CV and KB gate inputs, and a full MIDI controller. Additionally, the Stage II keyboard boasts great new features including; MIDI over USB, MIDI Clock Sync, an arpeggiator, Tap Tempo, and a stylish new black finish. The addition of MIDI over USB makes this performance and sound sculpting tool even more powerful. Combined with its warm analog sound, ability to process external audio and its intuitive performance, sound design and control features, the Stage II makes a great addition to any rig”rom full-on analog, to a laptop/softsynth setup. You can also connect the Stage II directly to a computer running the Little Phatty Editor/Librarian. MIDI Clock Sync allows you to synchronize the LFO and arpeggiator rate to the tempo of your MIDI sequencer, drum machine, or software. Sample and hold, triangle, square, sawtooth, and ramp wave modulations can now be perfectly timed with your rhythm tracks and the arpeggiator. The arpeggiator is a great new performance feature with applications for musicians in all genres. Its wide variety of uses is sure to find a place in any style, and, of course it also syncs to MIDI clock. Tap Tempo brings LFO and arpeggiator tempo sync functionality to situations in which there is no MIDI clock. The distinctive new black finish is a real eye-catcher that emphasizes the unique nature of the Little Phatty Stage II. Bass that fills your speakers to the brim! Turn your little phatty on, and brace yourself for impact. There is a fat tone on this synth that simply needs no EQ, and will quickly become your go-to synth for the foundational basslines and mix cutting leads you've dreamed about. The little phatty is an icon for analog warmth, heavy sounds, and signature modulations. A digitally controlled, fully analog signal path with a software librarian for massive instant patch recall capabilities... Yes, this synth beyond meets modern producer needs, and provides you with the proper sound for crushing any speaker. What an incredible sounding keyboard, sounds can not be matched especially the bass sounds and really fun to tweak and fiddle with. Good value for such a powerhouse. Turn on, play, sound amazing. if you are looking for an affordable model D sound with proper MIDI implementation check out the Studio Electronics SE1, I got one recently on the cheap hoping it would be like their old MIDI Moog with some added features and it did not disappoint. Its bummer to have to deal with a rack unit if you wanna gig with it, but otherwise its built like a tank and delivers a ton of Model D sounds as well as a lot more because of tis Oberheim filter modes. Totally a different sound than the Phatties side by side, cleaner, wetter, still Moog... the new Moogs and the SE1 double really well for sequenced bass lines. You smack this across the Furman yet? Always have wanted a Moog and this is a good start. I don't want to buy a voyager right away, so I can get familiar with analog synthesis on a simpler machine.